Use the Sale of Used Equipment Terms and Conditions when selling used equipment as-is with a waiver of liability and warranty. This Sale of Used Equipment Terms and Conditions is included in editable Word format that can be customized in Word or by using the included Wizard software. How do you write a Sale of Used Equipment Terms and Conditions document? Read this document carefully. It contains important information about your rights and obligations, as well as limitations and exclusions that may apply to you. For valuable consideration received, Seller hereby transfers all right and ownership in the equipment to the Buyer as of Current Date. By accepting delivery of the used equipment, other products and/or services and support described on the bill of sale, Buyer agrees to be bound by and accepts these terms and conditions. The condition of the used equipment is sold "as is" and seller makes no warranties, express or implied, as to the merchantability or fitness of the equipment for any particular purpose or use or otherwise. Under no circumstances shall the Seller be held liable to Buyer or any other party for any direct or indirect, incidental or consequential, or any other special damages arising out of or related to this Agreement or the equipment. This Agreement constitutes the entire agreement between Buyer and Seller with respect to the equipment and supersedes all prior oral and written agreements or representations and understandings between the Buyer and Seller concerning the equipment. This agreement may not be modified except by an agreement in writing and signed by both parties. This Agreement and any disputes arising hereunder shall be governed by the laws of State. A failure by any party to exercise or delay in exercising a right or power conferred upon it in this agreement shall not operate as a waiver of any such right or power. 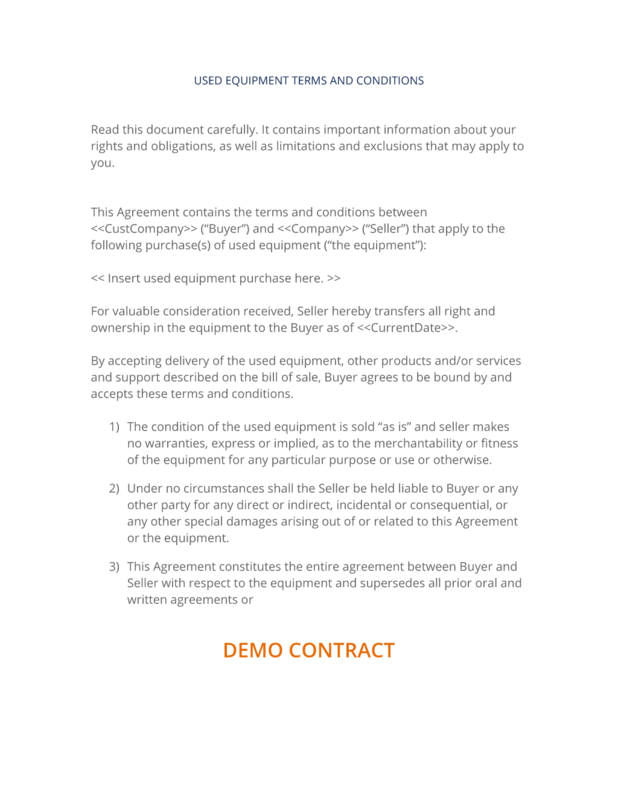 The complete Sale of Used Equipment Terms and Conditions - with the actual formatting and layout - is available in this Contract Pack.